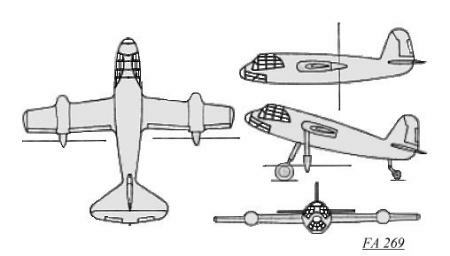 The Focke Achgelis 269 "convertiplane" was designed in 1943, after it was considered that enough experience had been gained in the helicopter field. The purpose of the "convertiplane" was to combine the vertical landing and takeoff characteristics of the helicopter with the much higher cruising speed and fuel economy of the airplane. The FA 269 was of a mid-wing configuration, with a slight sweepback of the leading edge and a compound taper on the trailing wing. 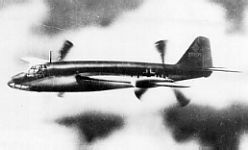 Each wing had an engine (either a Daimler Benz 601 or 605) mounted beyond midspan that drove a very large span pusher propeller. In level flight these propellers were in a normal rear-facing position, but for takeoff and landing the propellers could pivot downward through about an 85 degree arc. There was a special pivoting gearbox at the front of each engine, from which a drive shaft passed back between the engine cylinder banks to drive its propeller behind the wing trailing edge. In the completely down position, the propellers were almost parallel to the ground. A very long tailwheel undercarriage was thus necessitated, which retracted into the fuselage. A crew of two sat in a stepped cockpit located in the extreme nose, with the underside being extensively glazed also. This project was abandoned in 1944 due to the considerable development that would have been needed for the special gearboxes, drives, pivoting mechanisms and the propeller pitch control systems for use in landings and takeoffs.